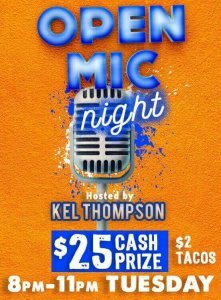 There’s only one open mike night that offers cash prizes, and that’s Tuesday nights at Marina84. While creativity should be its own reward, it’s nice to walk away with a heavier pocket after appearing onstage. With sign up starting at 7:30pm & the show at 8 p.m hosted by Kel Thompson. The prize winners are chosen by the crowd, so performers are encouraged to bring friends. With great specials all thru out the night of $3 Jager & Fireball Shots as well as $2 Tacos! !